One of many that smashed the spoon. Just a preface - I am not a pro, just enjoy trying to learn as much as I can and figure out where each spoon shape and design fits in my box. These are all my opinions based on my experiences. So I have been playing with the Forest Marshall River spoon for about a month now. I purchased this spoon under the assumption that being a very narrow spoon it would sink and stay super low in the water column. Boy was I wrong, I have played with this spoon on many trips trying to find where this would fit into my arsenal. Getting seemingly more discouraged with each trip trying and not getting results I had put it away for a couple of trips. It has a pretty aggressive bend and when testing it in waters I thought it should shine I was highly disappointed with the action. In deep pools with both fast and slow currents it has a very wide wobble that was like a propeller at times. Casting into pools where you could see the trout they would run the other way as it came through the pools. Today, I decided to put the Marshall River back on and find where it shines. I found it, and boy once I found its niche spot it was a producer. Fish after fish there were no short bites but straight on fish smashing the spoon. 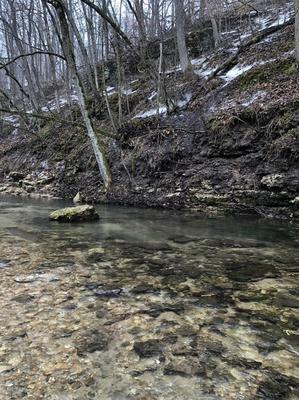 I found this really produced where the stream would have slight gradients with riffles and shallow runs. With slow retrieves back up stream the action was enough to keep from hanging against the rocks it really looked like a trout swimming up through the shallows. Targeting the slow edge of the riffle would also bring the fish out of the shadows and up into the riffles for a chase. The ideal run was 6-18” deep running though the rocks with a small shallow area off to one side and moderate flow. Attached are pictures of a couple fish brought to hand and examples of the areas fish were brought out of. I appreciate your insights and article. I have fished this spoon only once on Wilson Creek. There is a special pool (size of a desk top) that is difficult to fish. It seems to often have a nice trout in it, ready to pounce on any meal that passes by. Fishing the short Tenyru RZ 39LL is about the only way to work a lure into that spot. I fished it upstream, and just at the drop-off next to the pool in the riffles, "Walter" slammed it. It was a fun battle, but he got off in the riffles. A couple hundred yards further down the creek, I caught two very nice rainbows using a similar method. I'm going to try that downstream method that you talked about. It is so easy to get locked into thinking fish upstream and work the spoon a little faster than the current. I'm committed to making this "the year of the spoon." I don't seem to find much written on spoon techniques. Have you found much? Japanese videos have been helpful. 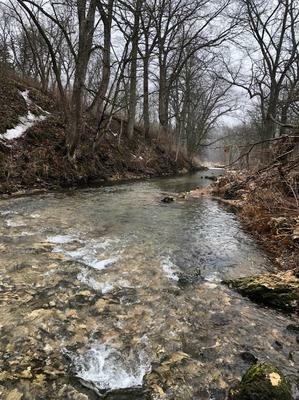 Your stream looks a lot like my favorite place to fish in the summer. I'm looking forward to fishing the Forest Marshall River spoon up there. It is the same stream I met the "Frank Nale Challenge" of catching 100 trout in one day. I'm not going to do a 14 hour marathon fishing session again! I also enjoy the manipulation and challenge of spoon fishing over spinner fishing. Saturday, I practiced the "wiggle the rod" technique in some clear water and discovered I had to really slow down my retrieve speed to keep the spoon down. I also learned to "beware of what may happen!" I was scouting with my son for carp, and just grabbed the Tenyru RZ 39 with the Cardiff reel loaded with 2 pound test line and a Forest Tournament .9 gram spoon. I figured there would be no fish as we scouted, and some practice casts on the lake would be good practice. I had a 4-6 pound carp follow the spoon up the shore! That got the adrenaline flowing! A few cast latter, I had a carp slam the spoon! I'm not sure my set-up could have handled a 4-6 pound carp! Lots to learn and so much fun. Thanks for the insights into your techniques. I'm going to add them to my repertoire. I had similar experiences with the spoons I fished last year. I found that I preferred fishing them downstream, almost exactly as you described. I had so so success in pools. I found that if I could make the first cast count, I would catch fish. After that I could see them follow it on nearly every subsequent cast, but not actually bite it. I suspect that the experimenting that you and Les are doing will yield some useful information as to what works in different scenarios. So much to learn, and so little time to do it. Yes, we have a lot we can share and learn! The trick I have found for pools is using a spoon with a wider and more rounded front edge with a small down belly on the front, this causes the spoon to dive. If the front is pointed it is more likely to rise in the water column and not stay down. I hope to write another article soon documenting some of my experiences with spoon shape and design. I've only fished the Marshall River Spoon once, at the end of a frustrating, fishless day when I had tried hard to catch some fish on a different lure. 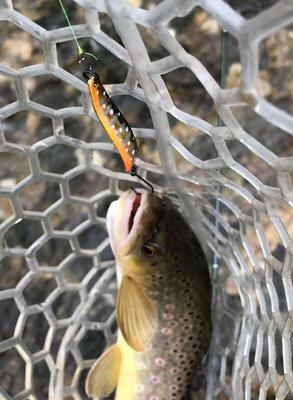 In a relatively deep pool with a couple big rocks, I had a fish follow the spoon out of the depths and into a shallows. A second cast with a much slower retrieve yielded a solid take and the day's only fish in the net. 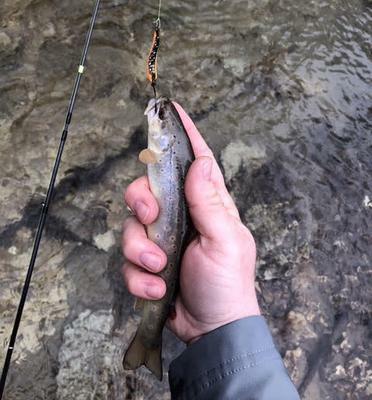 As Craig suggested, the Marshall River Spoon has a pretty aggressive bend, and it wobbles quite well with a slow retrieve. If there was one tip I could give people about fishing spoons it would be "Slow Down." I suspect most people retrieve most lures too quickly. On the streams I fish, most places where I could fish downstream have current that would be too strong to produce a lazy wobble. A "slow" retrieve is relative to the water around the spoon. In even modestly fast current, a stationary spoon might have too much action.